I’m here to tell you about about being a first time Mom at the Most Crowded, I mean…Happiest… Place on Earth. 2. Planning: We chose to keep our first trip pretty simple: 3 days at Magic Kindgom, and 1 day for Hollywood Studios. We figured we could add more parks into the mix as they got older, ensuring there would always be something “new” to do on each trip! Once we booked, we used MyDisneyExperience.com to sign up for Fast Passes and make dining reservations. Check with people that have their facts straight but I’m pretty sure you can make dining reservations like 10 years prior to your trip- thus ensuring that if you wait until the actual year you will be going on your trip- there will be no reservations left. Ok, that might be a bit of an exaggeration. I think it’s like 6 months or something. 3. Dining: So you’ve logged on at 12:01am and gotten all of your heart’s desire in the way of eating at Disney. Yay for you! You are a way better planner than me! You can probably skip to the next section, now. Seriously, be gone with you, you over-achievers…Ok, for the rest of you heartbroken slackers, keep reading. For us, this was our first trip to Disney with our kids. The girls were 3 1/2 and 1 year. I knew that this was probably going to be a somewhat yearly trip for our family and I figured that whatever we didn’t hit up this trip, we’d hit up next time around. There’s seriously so much to do and see, I felt like if we covered the basics and made it home alive, we’d be winning. So when I tried to get reservations 3 months before our trip, NOTHING was available. Not for breakfast, lunch, or dinner at ANY of the main places. So I dug a little deeper and looked “off-site”. Lo-and-behold, I was able to get a character breakfast at Hollywood Studios and a Cinderella dinner at the Grand Floridian Resort. Here’s the most important thing to know….food at Disney is not very good. (personal preference here, people) Unless you are into the whole buffet-style cuisine thing OR unless we are talking about Mickey Ear ice cream bars…because those are AMAZING! Ok, here’s the break down- remember all that hard work and sweating-it-out trying to get dining reservations? Well, we actually skipped our character breakfast at Hollywood Studios because we were having too much fun to stop and eat (You have to pay in advance so I’m pretty sure we lost our money on that one. Shhhh- don’t tell my husband). And the Cinderella dinner at Grand Floridian was FAN-tastic. I’m not talking about the food here, I’m talking about the experience. Quinlin waltzed with Cinderella in the middle of the restaurant and Prince Charming got down on one knee and kissed her hand. 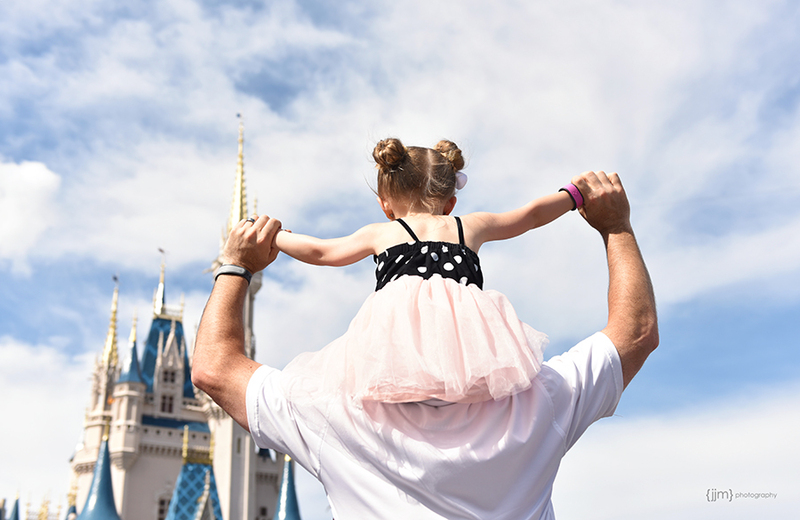 Honestly, as a parent at Disney World, what else is there? And, come on…I think Grand Floridian wins in the natural lighting category! Also, we walked right into Chef Mickey’s after a long day at the park one day. Yep, WALKED IN! This was the place that had ZERO reservations available for any meal during our entire stay. Walked right in. Never underestimate the power of a walk-in, people. 4. Fast-Passes: Get them, embrace them, love them. And don’t go to Disney without them. Everything at DW is done via those little brightly colored bracelets that you are required to wear your entire trip. I chose yellow thinking it would blend with my gold watch and bracelets and not be such an eye-sore. Anyways- these giant unfashionable appendages are like Willy Wonka’s Golden Ticket. Don’t lose them, don’t take them off, don’t even look at them the wrong way. These puppies are your entrance ticket to the parks, onto rides, into restaurants, your credit card if you so choose, and they are your personal ID for any photos you have taken during your trip (more on that later). They also carry all of your Fast Pass reservations on them. Fast Pass basically means that 10 years (or 6 months!) before your trip, you log on to MyDisneyExperience.com and select which rides/attractions you’d like to go on “line-free”. Some of them (like meeting Anna and Elsa) book up really fast so just start clicking because you can only sign up for three per day! Here’s a little Disney TIP– book your 3 Fast Passes early in the day because once you use all 3, you can find a Fast Pass Kiosk and book more Fast Passes! We stayed at a DW resort (The Contemporary) Staying on-site came with lots of perks! Perk #1: The Magical Express Bus will pick you right up from the airport AND take care of delivering your luggage to your hotel. Which means you literally walk off the plane, and onto a bus and arrive at your hotel, bag-free. Bags usually show up within a few hours. SOOOOO, here’s another little Disney TIP– pack a change of clothes in your carry-on so that when you arrive at your hotel you can change and head straight out to the parks! Perk #2: I think (don’t hold me to this), but I think if you stay at a Disney resort you get earlier access to sign up for fast passes and dining. Clearly, I did not take advantage of this perk. Perk #3: The parks have extended hours for guests staying at Disney resorts. We did take advantage of this perk when I found out all of the “Meet Anna and Elsa” fast passes were sold out. We found a day where the park opened an hour earlier for resort guests and sprinted to the Frozen Meet and Greet. We still wound up having to wait 2 hours for that one but I blame a faulty hotel clock and our backwards monorail for that one. Let’s talk about that, shall we…. 6. Monorails and Such: I was told a lot of differing info (most of it very helpful!) while planning our trip. I was told that you had to pack up/fold down your stroller before entering the Monorail, that the Contemporary hotel was “closest” to the Magic Kingdom, that bringing a double stroller to Disney was the worst idea ever, etc. Some of this is true. For example, The Contemporary IS the closest hotel to the Magic Kingdom…if you plan on walking. However, we stayed at this hotel specifically for it’s easy access to the monorail and it’s one-stop trip to Magic Kingdom. Unfortunately, we learned on our first trip out that although Contemporary is technically the closest to Magic Kingdom, the monorail actually goes in the opposite direction. Meaning that we had to do the Magic Kingdom resort “loop-de-loop”, hitting up the 4-5 other resorts in the circle before finally getting to Magic Kingdom. Such a bummer- but awesome on the way home, when we were the first stop! Also, we NEVER once had to fold up our stroller to get onto the monorail. We rolled that double-wide right through the line and directly onto the train. Every. Time. Talk about convenience. Perhaps we should discuss this stroller business a bit more? 7. Strollers: I did EXTENSIVE research on the perfect double stroller to bring to the parks. I even thought for a quick minute about bringing two single umbrella strollers because people were highly advising me against the side-by-side double. In my research, I was looking for the smallest, most compact side-by-side umbrella stroller. I wanted: lightweight, easily fold-able (I was planning for Monorail issues), fully reclining seats (for optimal napping and diaper changing because- ew, public bathrooms), baskets underneath, and the largest hood possible to provide the most shade. I eventually came across the Hauck. It wasn’t too bad and is currently on sale on Amazon for $250.00. This stroller was everything we needed. 1. My husband found the handles to be a bit lower than he would’ve liked. If they would’ve been adjustable, it would’ve been perfect! They were just the right height for me, however…coming in at a whopping 5’4″. We loaded this bad boy up like a pack mule every day and never once needed to disassemble, fold down, or unload. We rolled right onto the elevator, onto the monorail, right into the Magic Kingdom, parked it right in the nearby stroller parking lots during the rides, and rolled it right back home into our hotel room in the evening. Perfection! 1. I liked all the pockets and storage, plus the clip-on stroller handle feature was a must. Inside this diaper bag I had my two color-coded zip bags from Mother Load that I LOVE and use every day. In the blue Diaper Pouch, I had, diapers and wipes (obviously), along with my travel-sized baby products like sunscreen, hand sanitizer, stain stick, diaper cream, etc. In the yellow Bottle Pouch, I packed a ton of snacks. (Enter ziplock baggies once again.) I stuck these two colored bags inside my diaper bag which transformed it from a black abyss of All Things Baby, to an organized space where even my husband could find items. I then threw in a small one bottle cooler pouch. We bought a bunch of milk from the downstairs market at the hotel and loaded up our hotel mini-fridge. Every morning we filled up her “afternoon nap” bottle, stuck it in the small cooler container and threw that into the diaper bag as well. On each side of the LeSportSac diaper bag is a “side pocket” aka cup holder. I bought two stainless steel thermos sippy cups for the girls and filled them with water each morning and stuck them right in those side pockets. Kept them nice and frosty! And that was it! This diaper bag hung right on one side of the double-stroller. It was easy, organized, and contained nothing of any “value”. Therefore, we felt comfortable leaving it on our stroller in the patrolled stroller lots while we left to go on rides. Now, obviously we had to store our valuables somewhere, right? I used a smaller, much more streamline stroller bag from BabyCargo to hold our valuables. I kept my phone, wallet, camera lenses (great pockets for that! ), etc. in this bag. This bag fit perfectly on the handles of the other side of the double stroller and when we left our stroller to go on rides, this bag slid right off the stroller handles and was lightweight and easy enough for either my husband or I to carry as we went on rides or into restaurants. One last idea- order some of these foam clip-on fans! We bought two, clipped them on to each side of the stroller and I can’t tell you how AMAZING they were in the heat. We got stopped and asked about them non-stop! I also brought a ziplock baggie (Hello, favorite accessory ever!) full of extra batteries and a tiny screwdriver required for opening the back “battery hatch” of the fans. We used the fans non-stop so the extra batteries came in very handy! 9. Buses and other Nemeses: I’ll keep this section short. Remember the part about the ease of the Monorail? Yeah? Ok- remember the part about packing your stroller like a sherpa? Well they went really well together, right? Pretty seamless and easy. But then, just when you think you are the Master of Traveling with Children- you decide to head to another Disney Park (in our case, Hollywood Studios and Downtown Disney) and then comes the dreaded BUS ride. Remember that part about NOT having to unpack/fold down your stroller? Well throw alllll of that out the window. You now need to dismantle, carry, and load all that junk unto a bus, WHILE also transporting/holding your children. It is NOT fun. Granted the two places we went were awesome and totally worth the trip (Hellllllo beer!) Just be prepared, that’s all. The buses and the unpacking, unfolding, etc. are NOT enjoyable and you will be 100x more appreciative the next time you roll your traveling circus aboard the Monorail! 10. Cameras & Photos: I really went back and forth about bringing my big DSLR. I knew I’d shoot with my iphone a ton and take lots of video with our video camera. Did I really want to lug around my big ol’ camera, too? In the end I decided that I’d be angry with myself for not having it- so along it came. I packed my Nikon D810 and I chose only two lenses: my 50mm f/1.4 and my 24-70mm. The first day I started off with my 50 and found that I wasn’t getting enough of “the experience” in my frame and that it was way too much work to be changing out lenses all day. So I strapped on the good old 24-70 and didn’t take it off the whole time. I wound up carrying my camera (cross body strap) the whole time. I wanted to have easy access at a moment’s notice. It was annoying at times, but totally worth it. I couldn’t be happier that I brought it. The one thing I didn’t do was bring my laptop. I did NOT want to be sitting in my hotel room on vacation editing and posting pictures, which I knew I would do if I had the option. There were times when I really wanted to share, but not having the option to be glued to my computer was really a win-win for everyone. Photos: You can purchase something called the Memory Maker before you go on your trip. Everytime you see a “photographer” at the parks, you can pose for a picture, they scan your Magic Band, and your photos get downloaded to your MyDisneyExperience.com page and you can download them directly from there. We bought this package for one reason and one reason only: to get a good family shot. I doubt we will use any of the other 141 photos that were taken of us or the girls, because the quality is ahem… kind of terrible. (Examples below.) BUT- we got a good(ish) family picture out of it, so to me, it was worth it. Handing someone a DSLR with a giant lens attached in the middle of the park and asking them to take a group photo just doesn’t really work when it takes a solid 5 minutes to first explain to the stranger how to use back button focus. 11. Outfits: Ok, I know this is what most of you were waiting for! Below are outfit photos with vendor info! -Take a picture of your child’s faces the minute they enter Magic Kingdom for the first time. Priceless. Right after I snapped this she ran to Ryan, gave him the biggest hug and said, “Thank you for bringing me here!! !” Heart. Melted. -Bring a swim suit to Magic Kingdom. “The Dumbo Area” (I’m not good with all the official names) has a really fun splash pad and we were not prepared! Luckily Disney has a very conveniently-placed towel kiosk set up nearby. We now own a $35 Dumbo Towel. 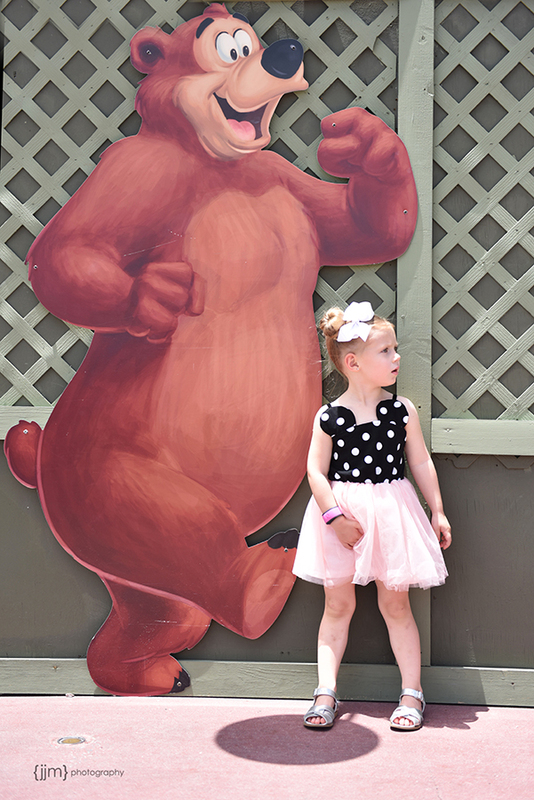 -If you can, spend a day at Hollywood Studios and get there early! The Disney Junior section is so adorable and early on, the lines to meet the Disney Jr. characters are not long at all! -Downtown Disney is totally worth a dinner out! So much fun shopping (and drinks!!) Be advised- make reservations, or risk waiting 3,489 hours to get into one of the big restaurants. Luckily, places like T-Rex: A Family Dining Experience, has this awesome excavation pit to help pass the time. 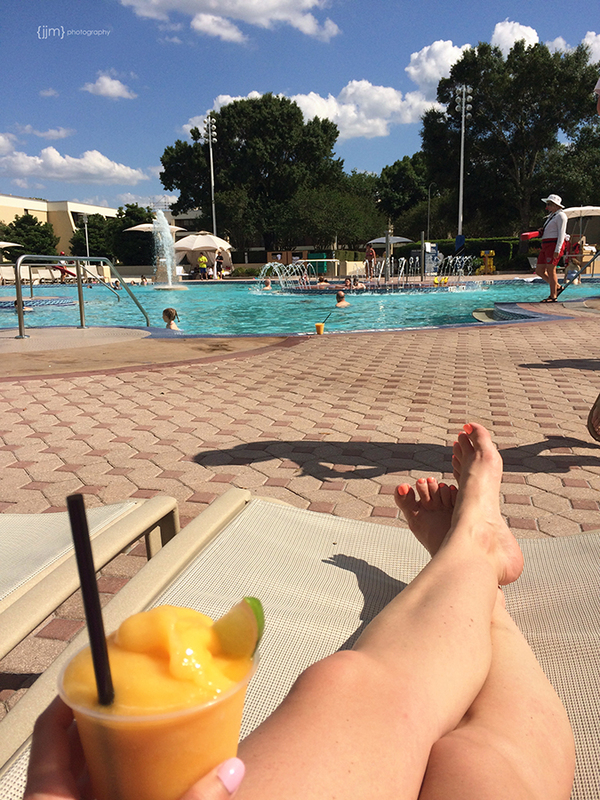 -Hit up your hotel pool one day, even just for an hour. It’s a great break from all the concrete and human cattle-herding, and it’ll make you feel like you are actually on vacation for a minute. -Figure out when the parades are, then- go on all the rides you don’t have Fast Passes for during that time! The lines will be much shorter because EVERYONE in the state of Florida lines up to watch the parades. And they are cute- check one out. No one needs more than one parade. -Getting a photo in front of the castle without other people in your photo is virtually impossible. Get creative! Walk around the castle and find little nooks & crannies where you can get the castle in the background without a hundred other people in your photo. -Go to the park at night. We left every day to go get dinner and freshen up at the hotel. Usually after dinner we were exhausted and went home. But on our last night we went back into the Magic Kingdom after dinner and it was so much fun! The lines were a bit shorter, the temp was a bit cooler, and the whole park took on a new vibe. I highly suggest it! Even if you only do it once! #2 – I choose to buy handmade, simplistic costumes for the girls* (because they play dress up EVERY day and I’m not a fan of glitter, or vacuuming.) So it didn’t make sense for me to pay a ton of money for them to slap on a sparkly Disney store version of what Quin was already wearing. And you KNOW that’s the one she’d want to wear to play dress up every day from then on! 13. HAVE FUN!!! Try and let loose and have a great time. If you are anything like me you can get easily stressed out by the planning and rushing, and the “doing of it all”. Try not to get bogged down by the schedule and the constant rush of Disney World. If you miss a reservation or a fast pass because you want to sit and have ANOTHER Mickey Mouse Ice Cream bar, who cares?! If you decide that you’re exhausted from the day and you opt to order room service and put a movie on for the kids in the hotel room while you enjoy a glass of vino on the balcony with your significant other- GO, YOU! Remember this is supposed to be a “vacation” so try to enjoy it a bit. Although I will say this – we went into this trip with the opinion that if WE (meaning my husband and I) wanted a “vacation” we’d be sipping cocktails on a Caribbean beach. 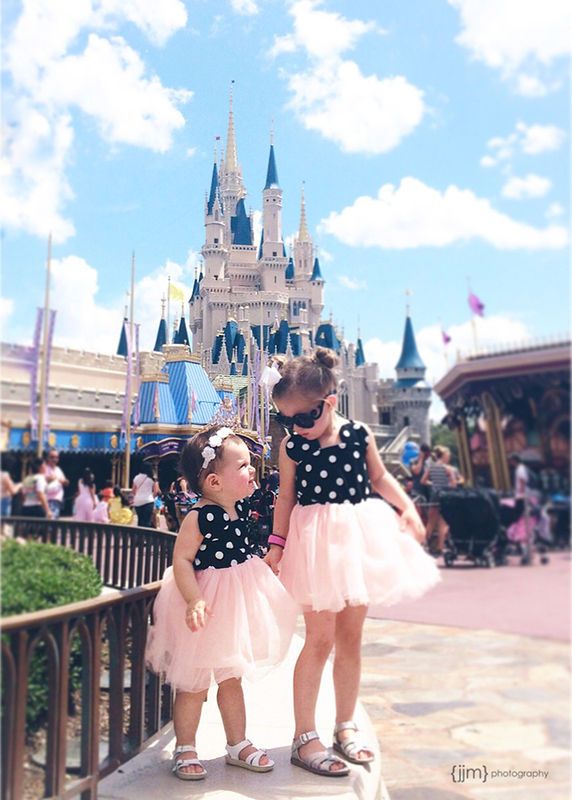 Going to Disney World is pretty much for the kids- so make it about them! It’s going to be exhausting and overwhelming- but let them take the lead and decide what sounds fun! Let this be a vacation for THEM. Let them be a part of creating the memories. They will remember it forever! For example, would we normally wake our exhausted 3-year-old up at 10pm to watch fireworks from the balcony? Probably not. But, I promise, watching the magic in their eyes as they take it all in, will make it worth every penny and every exhausted yawn. I’ll leave you with a few more photos from the trip. We really had the best time… if you couldn’t tell! I feel like you deserve some sort of a prize for making it all the way to end!